Say Goodbye To Messy Homes With This Cat Litter Mat! No More Scattered Litter! Cat owners agree over the frustration of constantly cleaning the litter around the house, not to mention the smell and discomfort of stepping on it. The Smiling Paws Litter Mat with ultra soft plastic fibers and TM 9 catcher technology will capture any excess litter stuck on your cat's paws when stepped on, leaving your house clean and smell free. Cats don't deliberately cause a mess around their litter box, it's in their instinct to scratch and dig. Depending on the features of your box, some litter always escapes on to the floor. A FUNCTIONAL litter mat should be large enough to cover the area around your litter box as well. 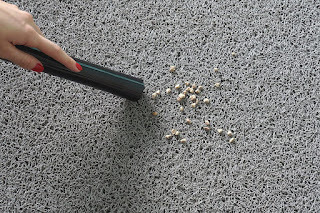 The litter catcher mat will cover a much larger area than other similar mats. Cleaning the cat litter mat is easy as pie! Simply shake any excess litter trapped on the mat back in the litter box or in the bin for disposal. From time to time you may want to hose it down, and as this mat is completely waterproof, this will have no effect on the mat's quality. Our litter catcher mat is made of highly durable premium Commercial-Grade vinyl without any harmful chemicals AND is BPA Free. 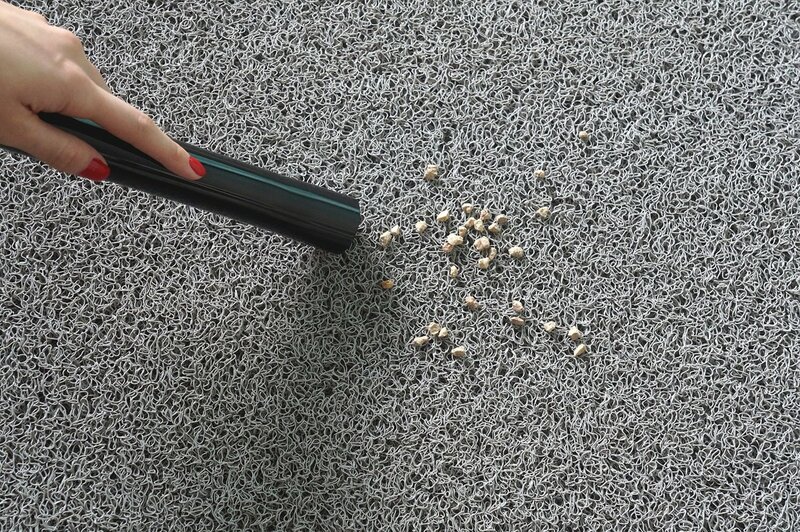 This mat is NOTABLY STURDIER than other mats and will not tear or rip when shaken as experienced with other mats. This quality rubber will easily withstand scratching and clawing. The non-slip bottom is made to grip for increased stability. 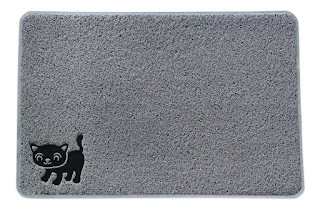 I love this Smiling Paws Premium Cat Litter MAT! I have 4 kiddos so I hate when I find cat litter anywhere in the house because I know exactly where it came from. I sometimes find it on the couch, but most of the time its a few feet from the litter box. Since getting this Smiling Paws Premium Cat Litter MAT and placing the litter box on it, I haven't seen cat litter anywhere but in the box and on the mat. I love that it seems to catch whatever the cats toss out, but it also grabs whatever is stuck to the cats paws before the go walking about my house. This is a terrific cat litter mat and I absolutely love that it's large and actually works like it's supposed to. I highly recommend this Smiling Paws Premium Cat Litter MAT to anyone with a litter box. Visit http://smilingpaws.net/ to learn more! Follow Smiling Paws on social media!